For long it was believed that diamond necklaces were meant only for a privileged few and considered as status symbol as diamonds were prohibitively priced and not affordable by the rest. 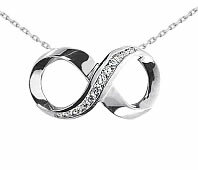 Things have however changed lately and today you find ladies of different economic strata sporting diamond necklaces though the dazzling effects of diamond necklaces continue to remain unchanged. The price of a diamond necklace, like all other diamond jewelry, is determined by the size of the diamond, the impeccable quality and the number of diamond pieces used in the necklace and the quality and type of metal used. Full diamond necklaces often necessitate the use of a large number of diamonds set along the entire length of the chain to produce a dazzling effect while a single specimen diamond should suffice for tear drop and other pendant type necklaces to produce the same dazzling effect. Another way of describing this is simply to state that the jewelry piece should be complemented by diamonds and not overpowered by it. In some necklaces, it can be done with a simple single diamond and in others a host of pave diamonds make the piece. 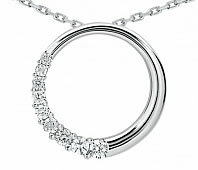 Novori Jewelry has diamond necklaces for every taste and budget. It is said that the charm of a diamond necklace derives its dazzling effect not so much from the size and quality of the diamonds but from other factors like the metal used, design and settings. All Novori jewelry is made with quality gold or platinum and we use top jewelry craftsman to work on each piece. Diamond necklaces are much sought-after because they are incredibly durable as diamonds are hardest substances and superior quality diamonds are some of the most brilliant of all precious stones. Novori has creative artisans who strategically use platinum or white gold for diamond settings to provide the illusion that the diamonds used are larger than they actually are. Likewise, the use of numerous strings of small diamonds on a necklace can produce the effect of a more substantive piece of jewelry than a similar necklace having a few large diamonds. A dazzling diamond necklace makes the perfect gift for any woman – be it her birthday, wedding anniversary or any other similar occasion. Diamond necklaces are irresistibly charming and are available in different styles, colors and price ranges. You will always be able to find the perfect dazzling diamond necklace for the special woman of your life. Diamond necklaces are found at just about every jewelry shop in every part of the world. There are simply three factors you need to decide before venturing out to buy a dazzling diamond necklace – the price range, metal to be used (silver/gold /platinum) and whether you want the diamond to look sober and eye-catchy or bold. The price of the diamond necklaces need not unduly obsess you because there are elegant and bewitching diamond necklaces even at the lower end of the price range. The choice of silver or gold or platinum has more to do with one’s personal preference. One thing is certain - you can never go wrong buying a diamond necklace as a gift as it cannot be improved up on as the ideal gift for any occasion. Just be careful that quality metal and diamonds are used. There is much jewelry sold at discounted prices because the quality is not in the product. Novori Jewelry sells quality products, quality ethically minded diamonds are used and we do cut corners on the quality of the jewelry we sell. There are different styles used for designer diamond necklaces and you can choose from a simple matter-of-fact design that is perfect for daily wear to those that are lot more elaborate and extremely dazzling and ideal for special occasions and prestige gatherings. Choose the diamond setting that best suits your facial features and overall physical appearance. Select white or colored diamonds, sometimes called colorless diamonds. You will find an endless variety of combinations as well in colorless diamonds. Ask you friends to visually assess the necklace for diamond color and brilliance.